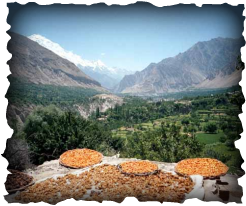 While Dr. McCarrison was preoccupied with caring for hundreds of British and Indian troops in the Himalayas, he found time to record his observations on the Hunza people, particularly what they ate and on their overall health. The Hunzas' good health made an impression on the young doctor. He found other villagers in the Himalayas had a high incidence of thyroid goiter. After running multiple experiments on rats and people (even himself), Dr. McCarrison discovered that goiter disease was caused by a diet lacking in iodine. For the next several years, McCarrison found regions throughout India where a particular disease was prevalent, and then set down to figure out what nutrition deficiency was causing the disease.